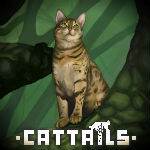 Some Suggestions | Cattails: Become a Cat! -Stepping over an item and being able to see what it is. You can do this with a mouse, but I like controls without using it. -Being able to mark the map. Maybe be able to make whatever x amount of tiles a different color or place a star on the world map. I stash prey and herbs in several locations and sometimes I lose track of them. -Collecting stones to make steps across rivers. For anyone who wants to do a no swimming run, also useful early in the game if you haven't upgraded the swim skill. -Burying items, so no one steals them. -Then have enemies steal those items if they run over them, maybe even a chance of members from your own colony being able to take something. -A fourth berry. One for each season, or maybe bring in apples. -Being able to go under bridges. It's fun to slide around on the frozen rivers in winter but even better if you didn't get blocked by a bridge. -Upgrading skills. Shorter cooldowns for each upgrade and for skills like Summon Allies, you get to call in more cats and maybe they can follow you from screen to screen. Wild Slash and Deep Cuts would just get more damage. -Cars and being able to get run over by one. It also would be cool if you could age up in the game so your not stuck playing the same character all the time and maybe once you've become old and died, (i guess?) could play as one your kittens? Just some other suggestions? Playing as a previous character’s kitten is definitely something I’d love to have. Have the abandoned cottage have twolegs in the summer and spring. Dogs too and maybe foxes and badgers. Mayor should give you patrols too with like Scout and Doc. Or have herb jobs. Maybe even have like badger and fox dens you can go in. There should be cars too. you know that if the cottage is abandoned sooo there would be no reason for humans being around it. but the same thing could be done with humans setting up tents on the map somewhere. Humans shouldn’t be in the game, but I do wish it was more challenging with cars and such.